Overlooked Expert was written in 2008, the predicted recession occurred and many individuals who were laid off fell into the unemployment or underemployment lines. Yet others, resourceful and enterprising, struck out on their own, taking their skills, knowledge and know-how to the world by starting a small business. Today, we are on the verge of another downturn. The time was right to revise and update a resource that has helped so many realize the dream of additional income at low or no startup costs. The first edition proved so successful that the ebook of the 10th Annivesary Edition is being provided free on the following sites B & N, Smashwords, free-ebooks. It is also available in alternative formats at Amazon, iTunes, Kobo, Scribd, 24symbols, Playster, and Google Play. To receive a free copy of the book and opt-in to Sarah’s newsletter, click here. 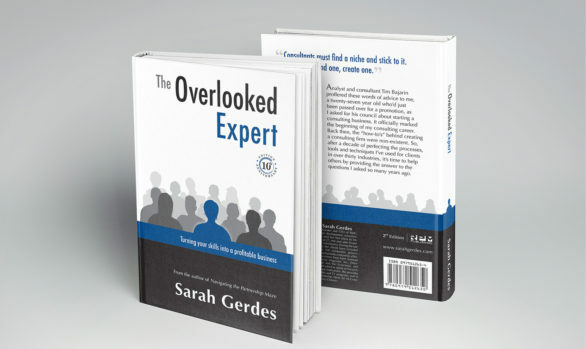 This 10th anniversary edition of The Overlooked Expert takes you further and deeper into the details of twenty-four overlooked experts who realized their strengths and formed profitable businesses. In this revised edition, strategic insights, business rules, hard-earned wisdom, tips, and bullet-point lists to be followed and checked off have been added. Some of the Overlooked Experts featured in this book never attended college, while others have multiple graduate degrees. Many continue to work full-time jobs while moonlighting in the off-hours to satisfy financial goals. People from all types of backgrounds who possess the same drive and desire: to run a profitable business. While the ages, industries and careers of those profiled vary, all have a few things in common: we (and I include myself in this category) all had an A-Ha! moment and realized we could be doing more. Beyond the initial discovery of an overlooked skillset, we used a commonsense approach to determine if our skills had a value on the open market. The natural result was starting a business for little or no cost and realizing immediate income. As you gain value knowledge and identify with the examples of others, it’s my hope you will take that first stop to a major life improvement, and in the process, be better able to weather the economic ups and downs that will surely come again.